I ate animal products for most of my life. My favorite meal was cheese pizza with extra cheese, pineapple, and banana pepper. I loved it – I could have eaten it everyday without getting sick of it. I always thought animal products were something my body required to survive and be healthy: chicken was a high source of protein, milk was a high source of calcium, and steak was a high source of iron. These were critical items in my meal planning, because what else was I going to have next to my mashed potatoes and broccoli? It wasn’t until I brought Brody home that I realized that animals were able to form incredible bonds and were capable of feeling joy, fear, and pain. I characterize Brody as a playful, smart, and curious dog. She even has this oral fixation–when we come home she will, without a doubt, grab a shoe and put it in her mouth. She won’t chew on them but rather prances around as if it was a welcoming gift for us. At this point I had only made that connection with canines and not farmed animals. A few years had passed, and one day I found myself debating online with a group of people. I remember defending a certain species that I had never ate before, and thought “why are people killing these animals for no reason at all! This is so wrong!” Then, someone called me a hypocrite for defending one animal and eating others. This was a HOLY CRAP moment for myself. I thought, wow, they are totally right. How can I love one animal and eat another? That was the beginning stages of my journey into Veganism and the fight for animal rights. It took me six months to transition–at first I thought “ok I’ll eat humane meat.” I remember visiting a grocery store and seeing a whole section dedicated to Jamie Oliver’s humane cuts of meat. I thought it was fantastic that companies actually cared about the humane treatment of animals, it certainly made me feel a lot better about my purchases, even if I had to pay a little bit of extra coin for it. Then I realized, how can an animal humanely be killed? There is no humane way to kill an animal who has the will and desire to live, just like our companion animals at home. I was skeptical of how “humane” animals were raised and quickly discovered that this is simply a PR ploy by the industry to make consumers feel better about their purchases, so that cushiony feeling I had when I made the “humane” purchase succeeded, but only for so long. I completed watching the documentaries “Vegucated”, “Cowspiracy”, and “Forks Over Knives,” and I enrolled in an animals and sociology course at my local university. Through these channels, I learned the horrors involved in the farming industry–not only was this extremely inhumane, but also a major contributor to climate change/deforestation and terrible for one’s health. I discovered that it is pretty evident, humans should not support the animal agriculture industry or ingest animal products. From there, I decided to ditch animal products altogether, I figured it was time to align my morals with my diet. It was not my love for animals that made me go vegan but the fact that it is unjust not to do so. I was participating in a mass genocide of animals who have the desire to live like we do. As part of a gender and a minority group that has felt oppression, I knew that taking a stance on animal rights was more than an appreciation for animals–it was a social justice move. I came across the term “speciesism” through a speech given by Raffaella Ciavatta, who described speciesism as “the assumption that non-human animals are inferior to human animals based on species alone.” Many times, I was told I was inferior because of my sexual orientation and gender. Anyone who does not support discrimination should take a stance on animal rights; non-human animals are individuals, however, when lumped together in a group, given a number instead of a name, and labelled as a product, their identity is stripped from them. All animals are sentient beings who have the capability to form bonds, who are family oriented, feel joy, feel fear, feel pain, and so much more. I can characterize the hens (Murray and Steve) and pig (Oliver) I have at home just as detailed as my dog Brody. When you take these animals out of an oppressed system they regain their identity and are seen as individuals. I have been vegan for two years. I wish I could say it was longer, but I can’t. I am also learning new things everyday, I never claim to be perfect. Myself and my fiancé are happily vegan and do not miss eating animal products and do not miss omitting animal products out of our lives. We have learned to cook delicious vegan meals and learned new ways to enjoy our appreciation for animals. For those thinking of transitioning to veganism, I applaud you for wanting to better yourself and for reducing the amount of suffering in the world. Next time you take a bite of an animal or animal by-product, please think of “who” you are eating, not what you are eating. Much love. 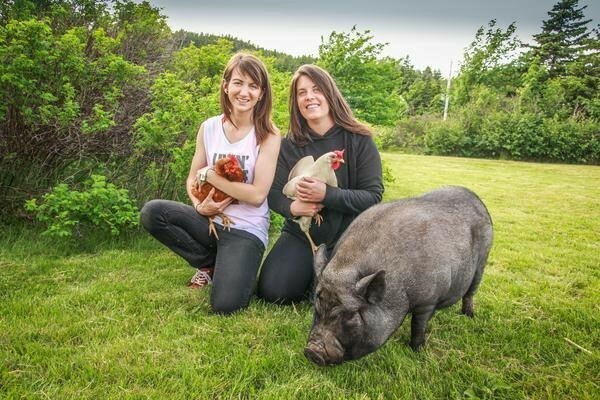 Renee Gosse is a Safety Engineering Technologist and an organizer with St. John’s Farm Animal Save – a chapter of the Save Movement.